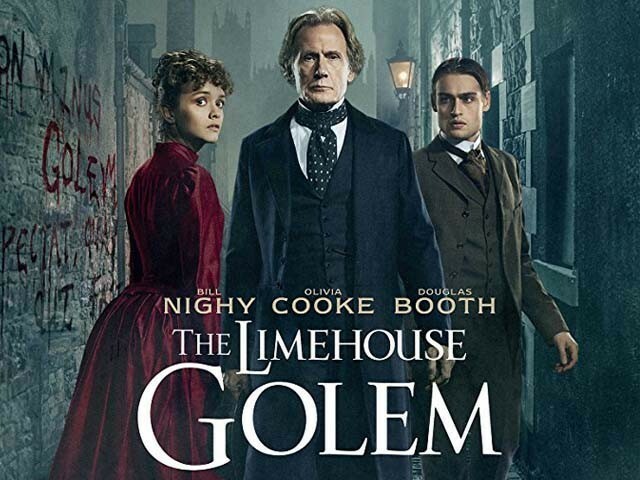 The Victorian era gothic mystery, The Limehouse Golem, will remind you of a number of Alfred Hitchcock’s directorial rudiments. These include his famous methods of handling the suspense rather than utilising the milieu of surprise, the redirection of guilt, and most importantly, the MacGuffin technique, where a pleasant felon pursues certain ambition. Director and writer Juan Carlos Medina adapted this film from English author Peter Ackroyd’s novel Dan Leno and the Limehouse Golem (1994). His film’s theme can easily be linked to a plot pocketed from Jack the Ripper’s mystery murders, with lots of Sherlock Holmes effects. It has lavish baroque amalgamation of real historical notables, fictional characters, layers of flashbacks and malefactor scheming that incorporates serial murders. Set in 1880 Victorian London, Elizabeth Cree (Olivia Cooke) is accused of poisoning her husband John Cree (Sam Reid), a failed playwright. Scotland Yard appoints Inspector John Kildare (Bill Nighy) to solve the mystery of brutal murders in the poverty-ridden area called Limehouse. Kildare swiftly ascertains a link between John and other Golem murders. His Holmes style investigation revolves around several characters, which were also real life famous people of that era. These characters include the music hall singer and comedian Dan Leno (Douglas Booth), the political theorist and sociologist Karl Marx (Henry Goodman), and The Odd Women novelist George Gissing (Morgan Watkins). 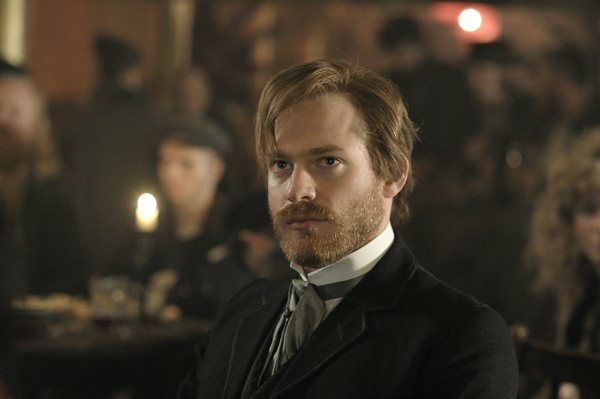 Kildare further establishes a point that he must save the life of Cree’s innocent wife, a former music hall singer named Little Lizzie, and invests all his time and efforts in proving her innocent before her execution. 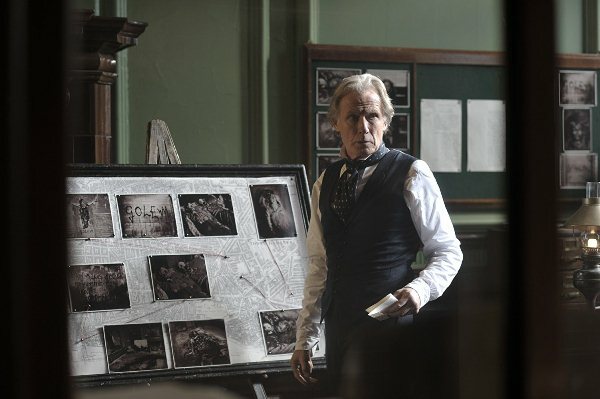 While narrowing down the suspects, he gets hold of handwriting samples which helps him reveal who the real Limehouse Golem is. The rest of the plot is interlocked with empathy, advocacy, challenges and obligation to fulfil justice. The set design, costumes and technical treatment to reconstruct a 19th century London with dimly lit pathways and loud music halls in conjunction with enigmatic police inspector, theatrical icon and celebrity obsession, is alluring for all moviegoers. To construct real-life incidents and legal framework, both Medina and Jane Goldman interweaved their period piece with some great detailing. Both director and screenwriter skillfully covered the ambience and details. However, the predictably superficial plot leaves moviegoers disappointed, since the weak plot left numerous grey areas. The project craves a stronger mastery than just a visual accomplishment. Moreover, the unsavoury screenplay by Goldman mostly failed in delivering thrills. Viewers can’t resist the feeling of breathing in the same era, but worn-out storytelling abolishes the overall effect of a compelling thriller. The attempt to fuse social drama with tragedy and suspense actually peeps at some of the intersections. Pirates of the Caribbean: Dead Man’s Chest and Love Actually famed Bill Nighy gives a robust lead performance. Although the plot oscillates between horror scenes and melodrama, Nighy’s acting skills remained stagnant and give a feeling of a royal privilege and concentration. To sum up, The Limehouse Golem does not create too many chilling criminal thrills, twists and turns. The film switches quickly from stage performances to street crimes and I feel this jumping is enough to disrupt spectator’s concentration. The most enticing areas of this fictional anecdote are get-ups, stunning cinematography and a tour of 19th century music halls. However, the film never feels like it goes beyond the surface. If you are a die hard fan of period mystery movies then Medina’s directorial venture is perfect for you, despite the less horror aspect and high level of predictability.